Welcome to Roundstone, Co. Galway, located at the foot of Errisbeg Mountain. This small Irish fishing-village offers beautiful views of the Atlantic coast and mountainous terrain. The collection of field recordings captured from within the village were recorded for a short-film titled Taboo. With little interruption from any kind of noise pollution the village and surrounding area features a crystal-clear soundscape of natural found-sounds. 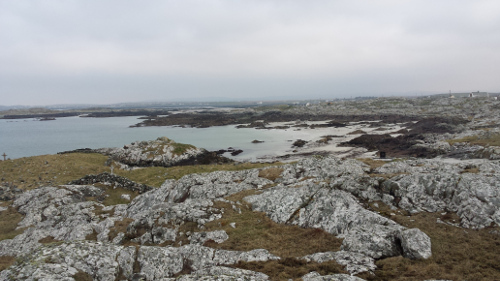 Roundstone is home to many white beaches, from small and private to wide stretches. Each beach has its own unique soundscape, with rumbling waves and breath-taking wind offering a rich tapestry of sound. Sound travels for long distances due to a lack of absorbing surfaces. Ocean recordings are a favourite of mine due to their meditative sound, these recordings of the Atlantic in particular have a healing effect and I go back to listen to them time and time again. This track features recordings captured during treks through the terrain of Roundstone. Stopping at various points to record the rich wildlife. 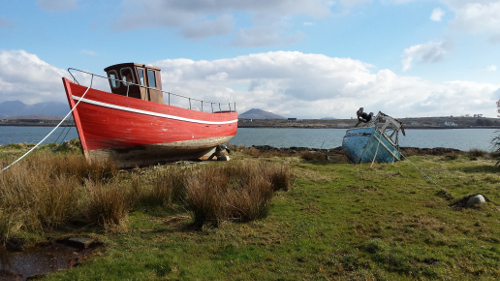 Our stay in Roundstone was highlighted by spring weather, the sun shone and the rain kept at bay. Along my treks I was greeted by donkeys; hens; cows; sheep; birds; bees and horses, all evident in this track. At one point a pair donkeys took great interest in the microphone, sniffing and rubbing against the furry windshield. The wind coming in off the Atlantic was ferocious. It was planned to use the wind as a tool to emphasise tension building in certain scenes. One of the locations for filming was in a barn situated up-hill from a large beach. The opening sound in this track comes from within the barn where the wind batters against the corrugated roof. The final section of this track features a recording taken from cliffs near a cottage some of the crew were living in. The cliffs edged out towards the Atlantic, below was a view of sharp jagged rocks guiding the foamed water into patterns, the overall view was of the misty ocean which demanded your attention for as long as you could bare the wind. What felt like rain was actually ocean spray whipped up by the gusts. This recording isn’t perfect; a couple of foot shuffles and microphone windshield noise can be heard, however this adds to the overall rawness of the recording and takes me straight back to standing on those rocks with the wind and spray in my face. Due to this it remains my favourite recording of the trip. While I was recording the wind from within the barn I was called by the films director to quickly rush over to where they were filming a quick cutaway shot 20 meters or so from the barn, here was a gate leading down to a white beach and this harmonic whistling sound. The Atlantic wind blew through holes in the rustic pipes of the gate, creating these dissonant notes. This was quickly termed ‘The Musical Gate’ by the crew and became the main soundtrack to the film. This sound is also special to me personally, very rarely do you come across such interesting musical sounds created by the landscape. I’m very glad to be able to share this secret sound of Ireland with the world through this release. The final track in this collection sends the listener to a pond. 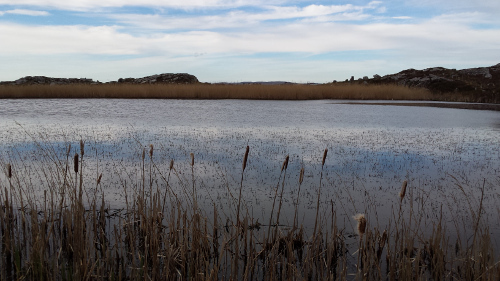 The track opens with the wind blowing through reeds producing a crackling sound. Hydrophone recordings are then introduced showcasing a symphony of pond insects. The sounds were recorded early in the evening of an overcast day with rough wind and the occasional sprinkling of light rain, I enjoyed every moment of listening to the underwater mics as the rain came down. The pond was used as a location for a scene in the film. After the scene had wrapped I stayed behind to be able to record the area in silence. A couple of hours of recording passed and I radio’d back to the crew to come and pick me up. The ocean, as Bernie Krauss wrote in his book Wild Soundscapes, is very difficult to record. He created his using layered sounds when he was recording ocean waves to include on the accompanying compact disc Discovering The Voice Of The Natural World. 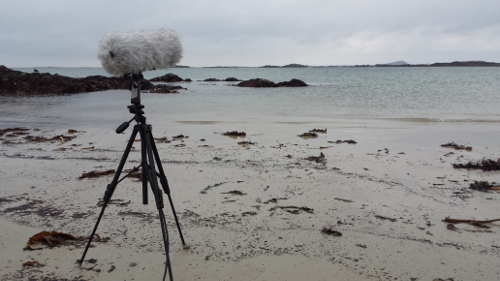 Sound recordist Lewis Gilbert, with the purpose of field recording for a short film score called Taboo in Co. Galway, has beautifully captured the Atlantic Ocean and presents its unique ambient soundscape as the opening track on Roundstone. Waves crash and hiss with a luminous flow of sound that allows small sonic fragments to emerge and pull your ear out of the low tones and rhythm of the ocean and onto the west Irish beach. ‘Cloch Na Rón’ follows and I am softly hit by an aural wave of springtime. Birdsong, a cockerel, bee wing oscillations and donkey braying transport me to where Gilbert walks. It’s cute but not so majestic as the opening track. However, as soon as we hear him move into another location, with the distant church bells ringing and the wind sound slowly diminishing the real intimacy of this piece opens up and shines. Gilbert is clearly reveling in the moment when listen so deeply that the world becomes a soundtrack to your very soul at that present time. Its sense of personal enthrallment and wonder draws the listener’s ear in to engage with this album. The third piece ‘Howl’ starts with the distant swirl of wind sound that gradually increases in ferocity and force as we are taken out of the barn and out to the cliff top. 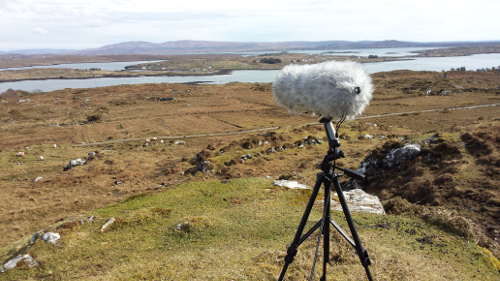 It’s a fantastic piece of sound recording that reveals how the west Irish coastline and the hardy wildlife are ravaged by the natural elements. The stand out piece of the album is ‘Music for wind’. I often find that the chance sound recordings are the most precious gifts, and Gilbert would have thanked his lucky stars when discovering a rusting gate that created this spectacular drone of wonder. Rusting holes of a gate behind the beach create dissonant notes as the coastal wind is blowing harmonically through them. It sounds like a trio of flutists improvising with the gulls and ocean and it’s hypnotic and inspiring. On the final track ‘Pond Symphony’ stridulations slowly emerge with more of a gentle staccato sound as Gilbert submerges his hydrophone down into the pond to reveal what is under the surface of the water. Sonically it’s a familiar sound to those of us who have, as Chris Watson famously said “put a microphone where our ears can’t go”. Its underwater symphony is a strong finale to an astonishing album where you can feel in each piece Gilbert immersed in the sound world of Co. Galway, eager to capture this environment, his personal experience of being right there, and to share the rich sonic material he has captured with the rest of us. Lewis Gilbert displays a delicate touch on the careful field recordings that adorn “Roundstone”. Focused on those sounds so many often ignored Lewis Gilbert amplifies them showing that music is everywhere. The pieces range from the loud crashing waves on “Atlantic Ocean” to the otherworldly work of “Music for Wind”. No matter what is source material is he does it a tremendous amount of justice. “Atlantic Ocean” opens the album up on an active note as the crashing waves wash over everything. Interestingly Lewis Gilbert provides a little foreshadowing as bird songs become increasingly more prevalent as the piece progress. Resulting from this foreshadowing the transition to “Cloch na Rón” seems remarkably natural. With the volume turned up the beautiful bird sounds become readily apparent. Out in the distance a rooster can be heard as can some mild metallic sheens as the song grows in scope. In the distance a bell rings indicating some semblance of settlement, one of the few times that humanity becomes apparent. Powerful in sound is the dominating wind of “Howl”. By far the highlight of the collection is the jewel “Music for Wind”. Completely gorgeous in tone it feels like a ghost visiting the world. Ending things off on a communal note is the delicate work of “A Pond Symphony”. 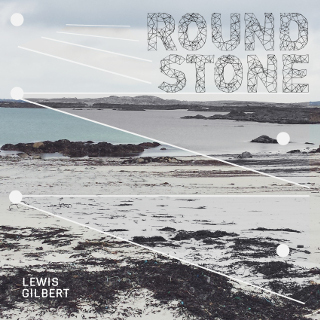 Literally the embodiment of life, Lewis Gilbert’s “Roundstone” is a tremendous work that celebrates the fragile sounds taken for granted. On “Roundstone” Lewis Gilbert creates an unhurried narrative reminiscent of Luc Ferrari’s best moments. Lewis Gilbert is a sound recorder on location for documentaries and films from South Yorkshire, UK. 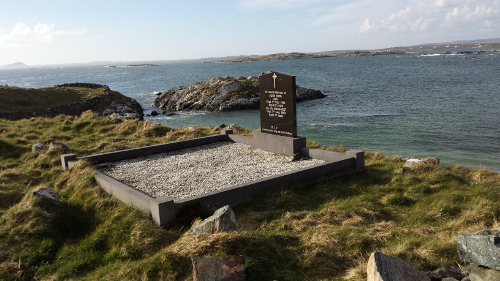 Roundstone, Co Galway is located at the foot of Errisbeg Mountain. This is a small Irish fishing village where a series of field recordings were captured for a short film called Taboo. The recordings consist in natural sounds of the environment without being soiled by the noise of the village. This is an area of white beaches and Lewis recorded the sound of rumbling waves approaching the beach as the sea is collected. The feeling of this repetitive sound invites to meditation. The singing of the seagulls wrapped in a carpet composed of a wind blowing is strongly appreciated. In addition, insects and crickets sounds and treks by Lewis himself were also captured. Lewis captures the sounds in detail with all the shades of the environment and its wildlife. The Atlantic Ocean is an eternal line that looks out at the shore from behind her untainted blue-grey eyes. Seashells lie abandoned on the white sand of the white beach. The ocean didn’t just deposit them here – it left them here. Little crabs scurry in and among the rocks. With every passing second, you can hear the repeating respiration of the sea. It rhythmically comes in and returns the world over, but no matter where you are or what ocean you look out at every beach and every shoreline will have a different sound. The ocean is the soft sound of tranquility. The ocean is the sound of infinity, a constant that repeats and yet progresses. Lewis Gilbert invites you to take a trip to Roundstone, Co. Galway, a small, Irish fishing-village that sits on the cusp of the Atlantic, and these pure field recordings take us there. Standing on top of the cliffs, the remainder of the land is quiet, the chirpy chatter of the birds and the gruff whines of horses only interrupted by the steady breathing of the grey sea. The blue waves don’t so much crash and clatter as they do ripple ashore, cushioned by the foamy surf. Of course, the sea can be a dangerous, completely unforgiving place. Those life-giving waters can also sweep life aside, but the real source of drama and imminent threat doesn’t come from the ocean on this recording – it comes from the rough winds that buffet and surround the water. A fierce coastal wind rustles and pops against the microphone. Rustling rain-jackets brace themselves as dark clouds full of drizzle gather and hover over the Atlantic. The fabric ripples, and the hood threatens to give way. It holds fast, but barely. The endless, sweeping sea commands your full attention (and your full respect). The wind whips up against the waterproof. Ocean spray spatters up. Seagulls fly turbulently in the air, swaying this way and that, struggling to gain any kind of momentum. You can feel the wind hitting the side of your face, giving a healthy color and an inner glow to your cheeks despite its soberingly cold fingers. An astonishing sound was discovered when the Atlantic wind blew through the holes in the rustic pipes of a nearby gate. Locally known as ‘The Musical Gate’, the whistling notes play day after day and are made entirely by the wind; it’s a sound created by nature, so you could say that the music is 100% natural. That driving wind plays another role in “A Pond Symphony”. It rolls through the reeds and through the grass. Hydrophone recordings play host to a symphony of pond insects. Recorded early in the evening of an overcast day with some rough winds and a fine drizzle of rain for company, the sound slowly focuses on the life of the pond. Even though you can physically leave the ocean behind, it would appear that the ocean can never truly leave your heart. Embrace the sound. Once the ocean has you in her arms, she’ll drag you out to sea. It is a sound that will always be with us; as sure as a golden sunset kissing the face of the blue.